Well my Holiday Decorating is finally done for this year. Unfortunately it rained here all weekend, which is not great for photography, very bad lighting and all that. I did the best that I could for now. I’m planning on taking more shots later this week, when the sun comes back out again. I’m also planning on breaking each room down over the next couple of weeks, with more detail photos, in addition to hopefully having some better quality photos, and I’ll be linking the projects that I did and sharing some sources and tips for some of the decorations that I used. So check back then! Well there you have it. It’s much more festive looking when it’s not pouring down rain outside, but like I said I will take more photos later on in the week. I hope you enjoyed this little tour of my home! so pretty!! Love the tree…it’s charming! P.S. your not so great pictures are most peoples fabulous pictures :). Can’t wait to see what you improve on! Aw, thanks Janel!! You made me feel better! Karen your home is beautiful! 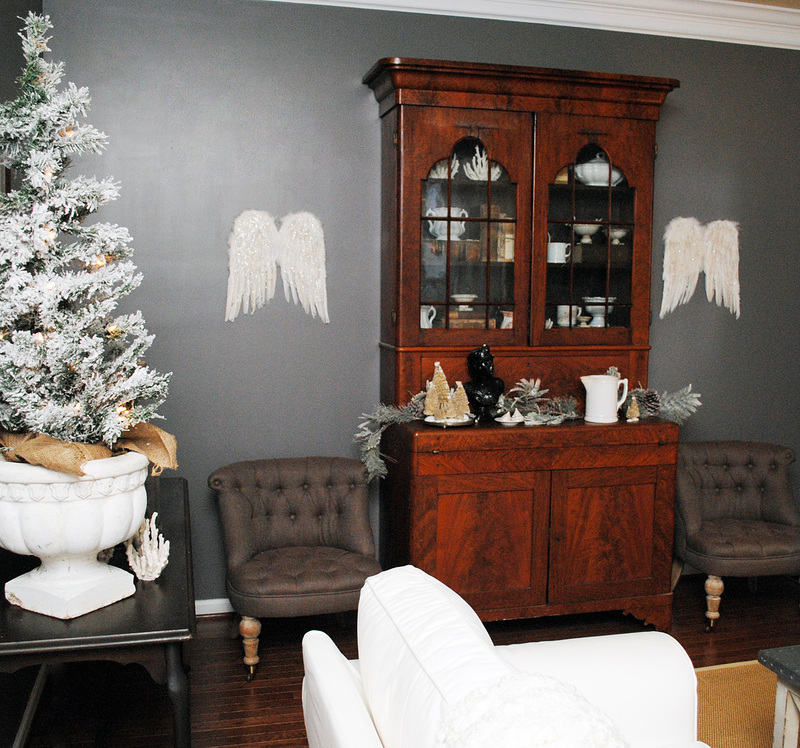 LOVE those Angel wings and your tree is so pretty too! 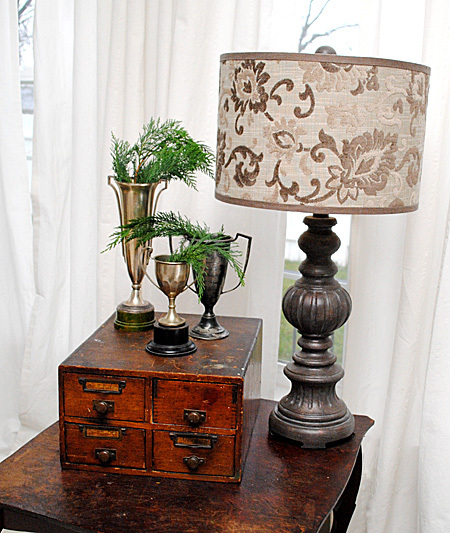 LOVE that burlap at the bottom.So simple and elegant! Thank you Anne! At the last minute I realized that the tree skirt that I normally use, clashed with this years decorations, so I just threw the rest of the burlap that I had, around the base. I really ended up liking it too. haha! Thank you so much Dawn!! Happy Holidays to you too! 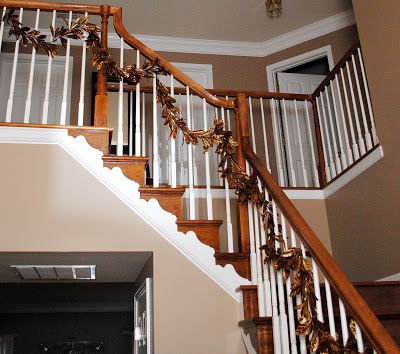 I enjoyed seeing your decorations in your home. So many interesting things in each room. 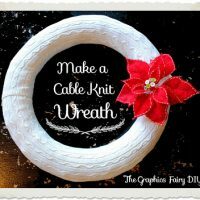 I love your tree and how you added the snowflakes onto the burlap garland. 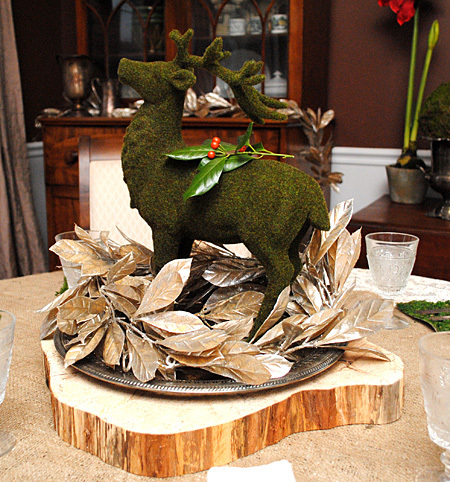 And that deer centerpiece on your dining room table is gorgeous. Looks like a feature in a magazine to me! Thank you Jane!! You are so sweet! Refined and Relaxed. HOW did you pull that off? LOL !! 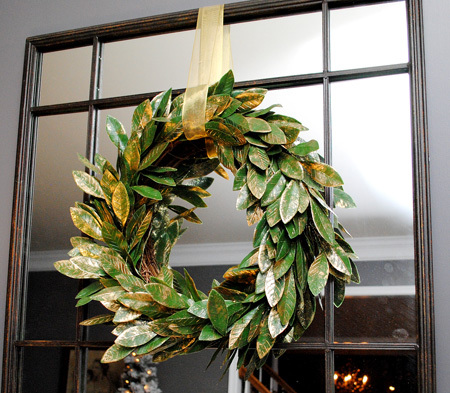 It’s a beautiful holiday season in your home!! Thank you for sharing it all with us – your are such an inspiration to so many of us year round. Aw! Thanks Sherilyn!! I really appreciate you’re very kind comment!! 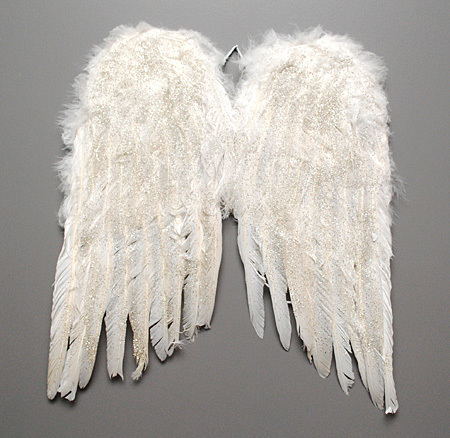 It all looks beautiful Karen and how special are those angel wings!! Thanks Kerryanne! I’m glad you liked the wings, I love Angels and I have wings and Angels all over my home all year round, but these feathery wings are just for the holidays! So pretty and I think you photos came out great! Love the huge mirrors you have. I also really like all the touches of greenery. oh the wings! so lovely! Thanks Michele, I just entered your wonderful giveaway! Love all your special touches. 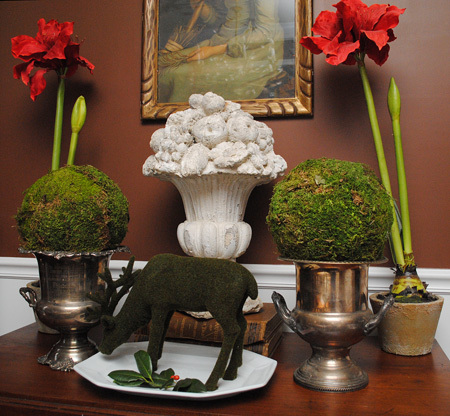 The moss covered deer and the table place mats. Everything looks great. Your home is beautiful! I love the colour scheme! Thanks Barb, I’m so glad you like it! Karen, you have a beautiful home. It was fun to tour it at Christmastime to see all your lovely decorations! Thanks so much for the follow Mary Alice and for the very kind comment! Aw thanks! And you are very welcome for the graphics, I’m so glad you like them! SOOOO pretty!!! 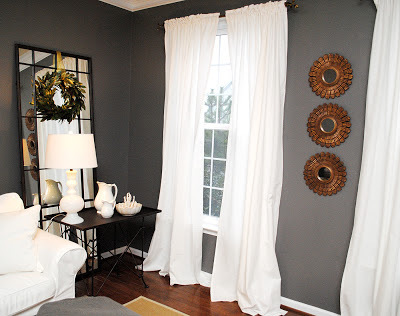 i am in love with those moody gray walls and the white against it! hopping over from jen rizzo! Thanks for the visit and the sweet comment Cassie! Wow! Thanks so much Katie! I hope you have a wonderful Christmas too! 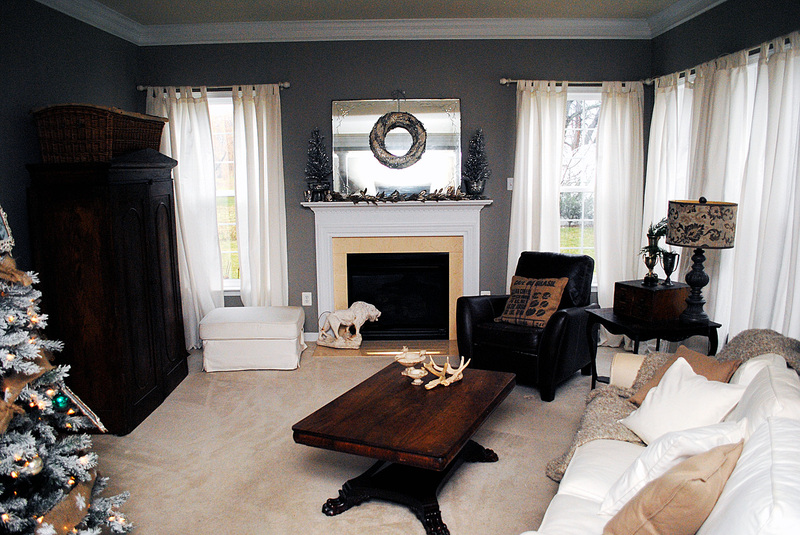 Your Christmas home tour is beautiful! Looks fabulous! Thanks for sharing. Simply stunning, simply droolworthy! You have a beautiful home and it was fun to see it after following all your DIY projects. I look forward to seeing your photo’s of each room, you have so many wonderful things to look at, I could spend hours here! Thanks for sharing your beautiful home, inspiration and lovely graphics all year round! Thank you so much Pendra!! Holiday Hugs to you too! Karen you have a brilliant home. I’m a fan of the white and dark grey. It looks so classic and refined. Cheers! Karen, I love that one wreath on the door. Is it bay leaves? Or maybe magnolia leaves? So pretty! It was rainy this weekend where I live too. No snow yet. Thanks for sharing your holiday home! Thanks Jennifer! Did you mean the wreath on the mirror? It’s supposed to be bay leaves, but it’s actually plastic, believe it or not! It has a great look though, it’s brushed with a bit of gold and backed with grapevine. I have 2 of them, one on each mirror on either side of the sofa. Beautiful Karen..I also love the feather Angel wings and was wondering if you made them yourself..and the tree is amazing with those big sparkly picture ornaments that you made hanging on it..Thanks for sharing your home with us this Christmas season and thank you for all of the wonderful things that you share with us all year long to make our homes look prettier! Thank you Nancy! No I didn’t make the wings, but it probably wouldn’t be too difficult to do. I bought these from a friend who has a shop and she marked them down half price for me, so I got a great deal! So lovely and understated Karen. I love so many subtle and unusual touches. I love the place mats and the angel wings. Your Christmas tree is so beautiful with the snowy look. Just great! 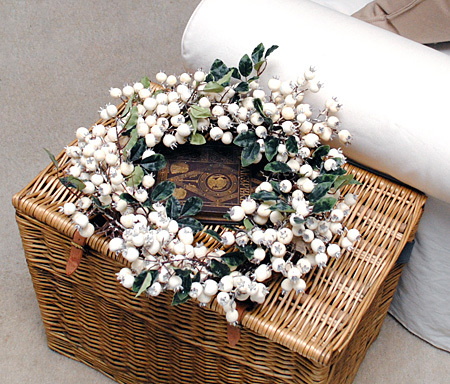 There’s so many lovely simple things that make your home so beautiful, in addition to the lovely furnishings and decorations already in place. The horse picture, trophy cups on the mini library card index box, and the angel wings are just a few that I favor. please share the color of those beautiful gray walls?? and those white curtains??? where are teh ty from? Sure! It’s Gauntlet Gray by Sherwin Williams. Oh and the curtains are from Ikea. Thank you Zoe! Merry Christmas to you too! Thanks for the lovely comment Trish! Happy Holidays to you too! Everything is beautiful! 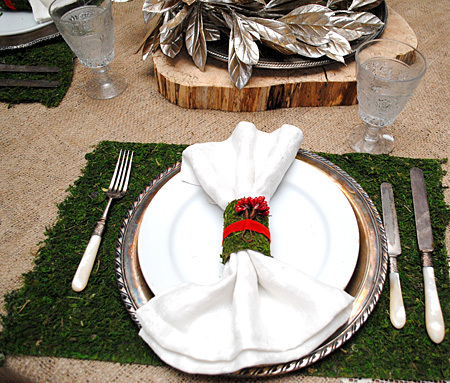 I love your tablesetting with the moss placemats and the little stump centerpiece. How wonderful to be in a woodland setting right in your dining room. It’s all so lovely! Thanks Sherry! Yes a “woodland” theme was what I was going for. Plus I think it will be fun to reuse at Easter too, so it’s pretty versatile! Karen – what an amazing, beautiful home you have!!!! You make everything so inviting and festive!!! I would love to see the outside of your home too and look forward to more pictures!! Thank you Lorraine! I do have a few photos of the outside of my home, it you click on “Home Staging” you should find them there, as I have been working on my curb appeal! Wow! Karen I am drooling over your rooms! The overall look is so wintery-wonderful! Even without the sun shining it is still bright! Those mirrors and the wooden wing are amazing! Unfortunately after recently moving, I am not into opening all my Christmas boxes this year. If I get the tree up and even simply decorated I will be happy! Thanks for the inspiration for next year! haha! Thank you Crystal! I’m glad you like it! Yes, give yourself a break and don’t worry about going all out. 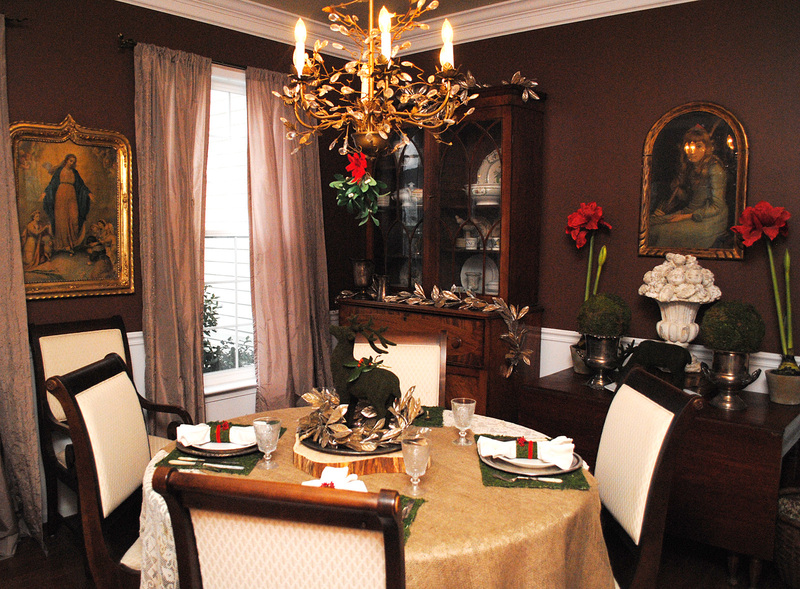 This is the first time that I’ve really decorated the house for the holidays in years. When I had the shop, I just couldn’t manage it, we did a tree and a wreath on the door and that was it. It was nice to have the time this year to do it, and I really enjoyed it, but of course it’s not necessary. It’s better to have less decor and less stress! Thank you Christie, that’s so kind of you! I am going to try to take some time to visit more of the blogs from Jen’s party later in the week, I will be sure to stop by yours! Very pretty! I always enjoy your blog posts and graphics! Merry Christmas! Thank you Monica! Merry Christmas to you too! 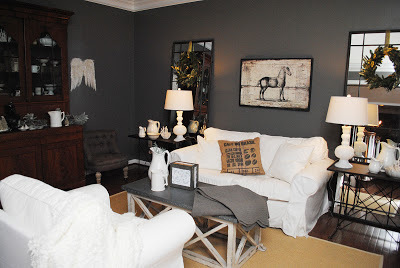 Fabulous Karen – those gray walls are amazing and all your little touches from the bottle brush trees to the sprigs in the loving cups … love it all! Aw! Thanks Kelly! I’m so glad you stopped by! Your home looks beautiful, Karen! Those little bottle brush trees that you transformed, look perfect in your setting. I’m now a new follower! Thank you Carol! I appreciate the follow! Karen, I love all of the touched to your home. 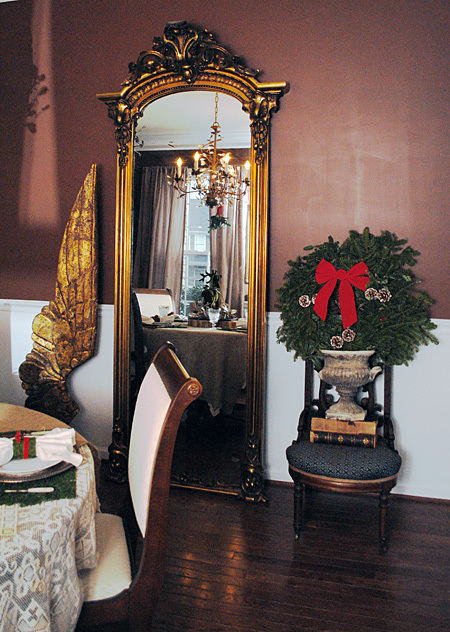 I am going to come over and steal that mirror. 🙂 Happy holidays. Thank you for joining in on the tour! Thanks Jennifer! 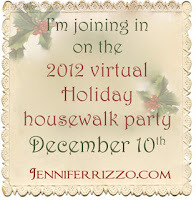 I really enjoyed linking up to your beautiful party! I know what you mean about lighting. When I was taking photos it was overcast or dark early for two straight weeks. 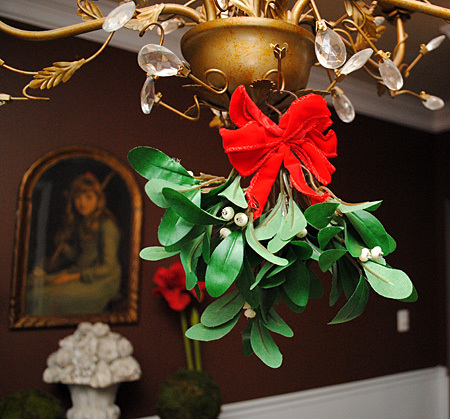 Your home is lovely and the holiday decor is pretty. I love your charcoal walls with the whites. 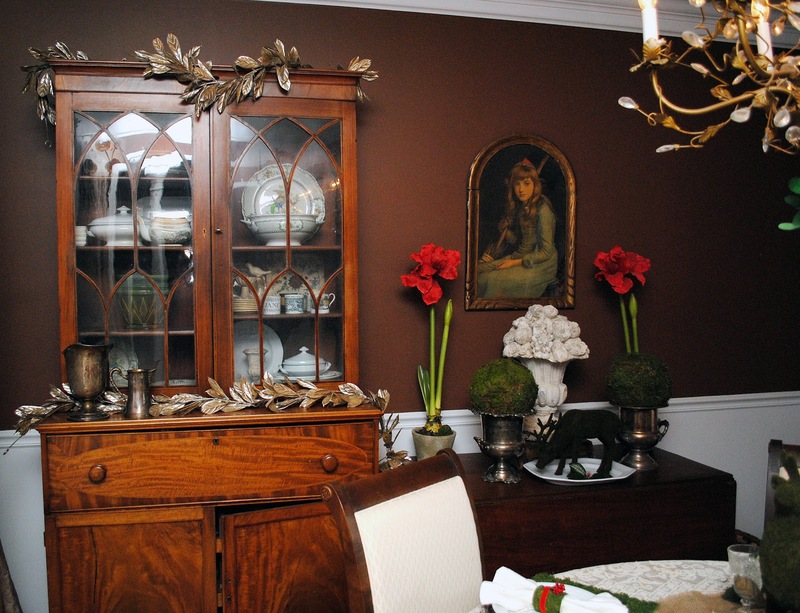 The mantel and tree are especially lovely. Thank you Elizabeth! It does make it more challenging when the sun doesn’t cooperate! You have a beautiful home and your tree is marvelous! You are a very talented lady! Thanks so much for all the things you show on your blog also! 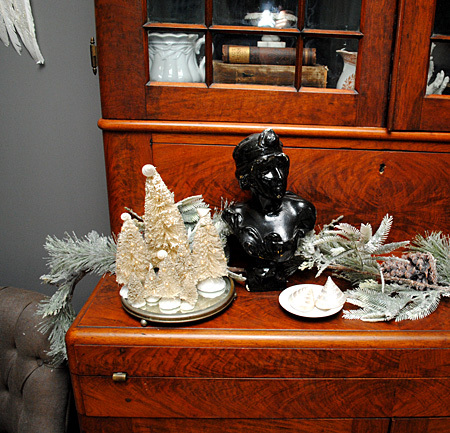 Love the elegant Christmas look! So tastefully done!! And thank you for all the graphics you share with us all year, I just down loaded the rein deer! Thanks Kim! I’m glad you liked the Reindeer too! Stopping by from Nester’s party ~ what a gorgeous style you have, so chic and comfortable! 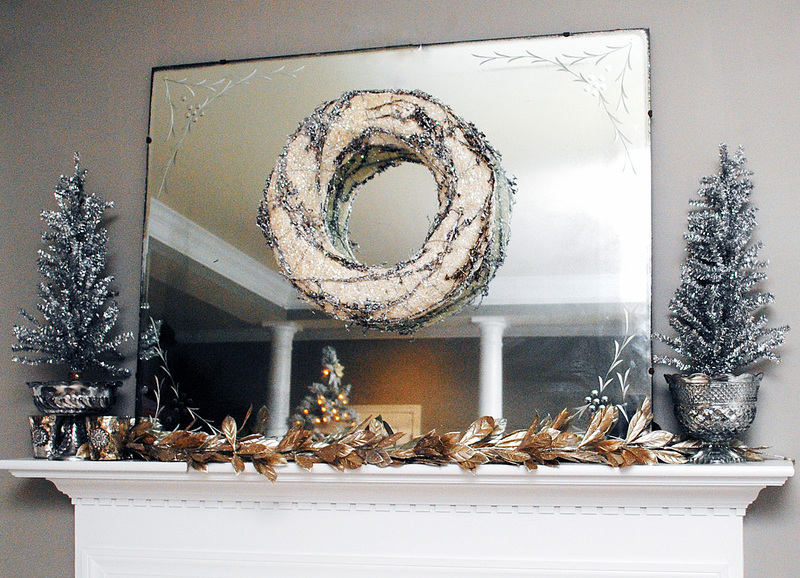 It’s all beautiful and your holiday touches are the perfect simple statements! Thank you so much Alison! Merry Christmas to you too! 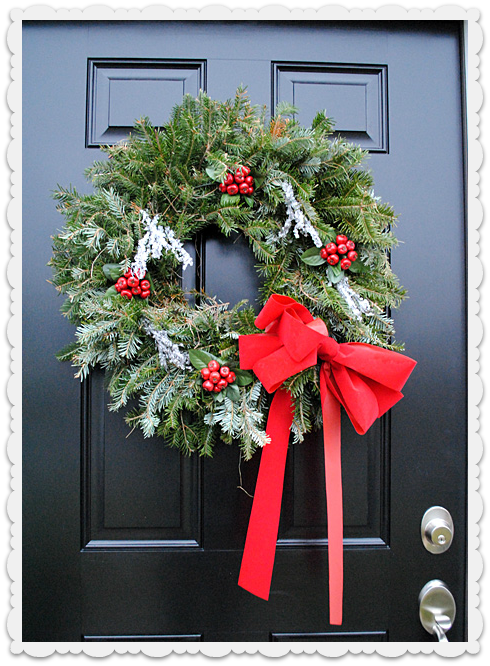 Your front door wreath is beautiful – I love the red berries! 🙂 Merry Christmas! 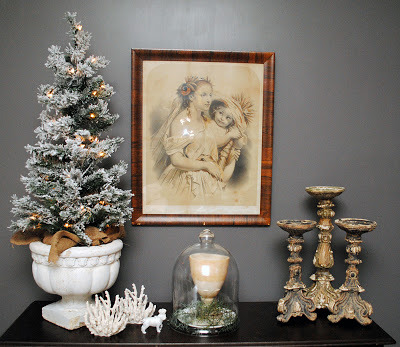 Very elegant and cozy Christmas decor. Loved the tour, your home is so beautiful.